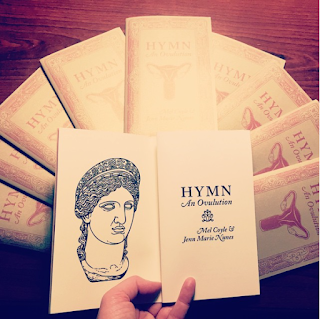 HYMN: An Ovulution is the second chapbook in the 2015 series from Bloof Books. Each chapbook in the series is released in a limited edition of one hundred numbered copies, followed by a digital release, and eventually a combination volume called Bound. her main reaction is blank bovine stare. down pink plastic selfies and sluts. the fogwitch goes in and out. in and out. the Dr. ain’t in but he sure ain’t out. is not new and neither are the Hitler references. Mel Coyle is from Chicago and other places where the corn grows. Currently, she lives in Ohio where she coedits TENDE RLOIN, an online poetry gallery. You can find some of her work online. Jenn Marie Nunes is the author of four chapbooks, including Object Reference Not Set to an Instance of Object from dancing girl press. Her work appears most recently in Similar:Peaks::, Tupelo Quarterly, Smoking Glue Gun, and Southeast Fiction, and she is coeditor of TENDE RLOIN, an online gallery for poetry. Her first full-length collection, selected by Switchback Books as the winner of their first-ever Queer Voices Award, is And/Or, and Juned is now available from YesYes Books.